"Salome with the Head of John the Baptist"
Richard Strauss' masterpiece of desire dangerously thwarted, and still more dangerously indulged, was brought by the Cleveland Orchestra to Carnegie Hall on Thursday in an eagerly-awaited performance. In addition to the powerful Jochanaan of Eric Owens, the evening boasted the Salome of Nina Stemme, sensual and searingly intense. The orchestra, under the leadership of Franz Welser-Möst, gave a performance of both beauty and power. The sound of the Cleveland forces was invariably beautiful, lushly, even obscenely so. The warm, shimmering clarity of the strings was a pleasure; the brass and woodwinds were both strong. What I missed--and I may be in a minority here--was a sense of Unheimlichkeit, an orchestral tension reflecting the mood of impending doom articulated by the Page, and later by Herod himself. Still, the tension escalated with entry of Salome, and ignited with on-stage confrontation (if one can call it that when the participants aren't looking at one another) of the princess and Jochanaan. My desire for more sounds to creep down the spine and chill the blood may be a matter of personal taste. I was on edge throughout the final scene, with its beautiful tapestry of sound disrupted by unsettling eruptions of percussion and shivers in the woodwinds. The dance of the seven veils was pulse-quickening, and the orchestra did summon brutal violence for the crashing, magnificent finale. Although dominated by its diva--perhaps inevitably so--this performance of Salome was blessed with a strong cast of singers. Although a bit rough at the outset, bass Evan Boyer warmed up nicely, and sang the roles of the First Soldier and First Nazarene expressively and with good phrasing. In the theological debates of the Jews, Matthew Plenk sang with his customary intelligence, standing out through intelligible diction and vigor with which he wielded a supple tenor. Jennifer Johnson Cano sang the crucial role of the Page with an appropriate sense of urgency driving her use of the text, and a darkness of tone which fit his dark pronouncements. As the besotted captain Narraboth, Garrett Sorenson was warm and ardent, and, admirably, found ways to intensify his expression throughout. Jane Henschel was an appropriately acid Herodias, but didn't overdo the shrieking or Sprechstimme; she was genuinely imperious, as well as genuinely afraid. 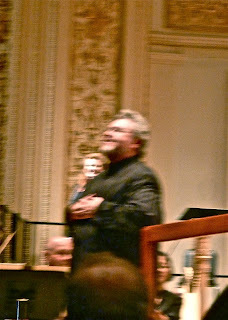 I could not always hear the Herod of Rudolf Schasching perfectly, but this may have been a result of where I was sitting. His characterization was excellent, nuanced enough to avoid caricature; he sang with intelligence and strength. 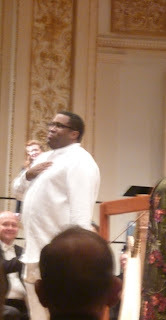 The Jochanaan of Eric Owens was superb, combining a sense of spiritual authority with raw vocal power. Owens' use of text and vocal color were alike masterful, bringing warmth and serenity to his descriptions of Christ, and deep, visceral horror--and command--to "Niemals, Tochter Babylons, Tochter Sodoms... Niemals!" His curse of the princess was bone-shaking. 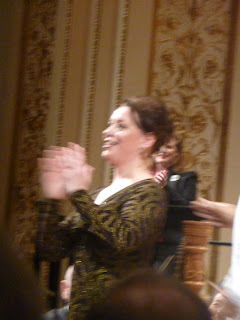 As for Nina Stemme... this was my first time hearing her live, and I was overwhelmed by her embodiment of the composer's infamous paradox: she acted the adolescent, and sang indeed with the voice of an Isolde, without audible vocal fatigue despite the demands of the evening. She pouted and sulked, impatient with the superficiality of those around her; with formidable confidence she worked to manipulate them. Her scene with Owens was a highlight of the evening. Her awe of the prophet was genuine, as well as her arousal. Stemme's use of text was superb, from the revulsion of "Maulwurfsaugen" to the scorn of "Scharlachnatter." 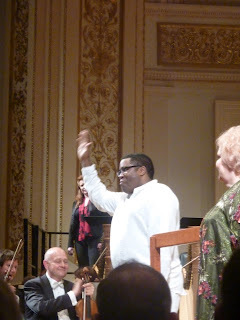 I was struck also by the security of her singing, from radiant high notes--which she could send soaring over the orchestra or taper to a delicate thread--to the dark notes demanded by Strauss to evoke the mystery of death. Moreover, she gave a performance of potent sensuality. In exultant triumph she colored every word of "Zu meiner eigenen Lust begehre ich den Kopf des Jochanaan." 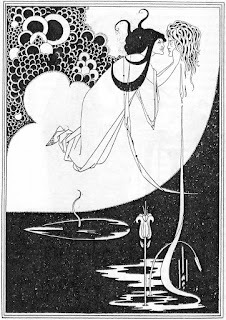 To see the impatience of desire so nakedly on stage carried the weight of shock; moreover, despite the fact that everything has gone horribly wrong and twisted, Stemme's Salome, in the radiance of her self-knowledge, remained sympathetic. When the head of Jochanaan was brought to the princess, Stemme cupped her hands around the empty air, and made me believe. And then, she flirted with it. Her question--why will you not look at me, Jochanaan?--was a playful, sexual challenge. And I watched and listened, dry-mouthed, as she triumphed and was destroyed. I haven't read enough to know if this qualifies as minority opinion or not but I also felt there was a dearth of DOOM. Well, at least I'm in good company. :) I felt faintly guilty, sitting at a Salome thinking "You know what this needs? More depravity and doom, dang it," but there it is. If you can't expect depravity and doom in Salome, where can you? It's what Oscar Wilde would have wanted. Perhaps Stemme's soul is too merry. 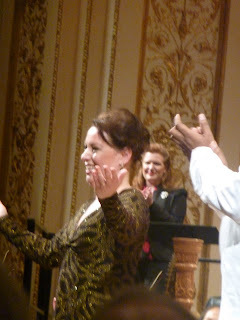 With Stemme's portrayal I had not a quibble... just diva awe! It was the sound of the orchestra (gorgeous) that I felt could have been more ominous. I really appreciated that Stemme didn't make Salome evil or a femme fatale at all... just seeking something she can't get from the warped world she's in.